Sometimes you search for treasure, and you strike gold. We couldn't help but look under (er, above) some ceiling tiles after finding the secret loft in one of the guest rooms. 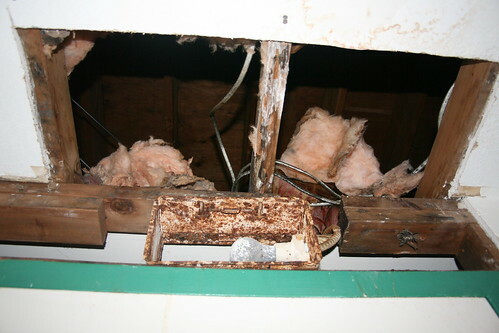 Here, above the ceiling line, in the space above the door frame, was the original "exit" sign fixture, severely rusted from years of high moisture levels. Remember, this hotel underwent major renovations ca. 1998, but also had been abandoned for years before that, hence the significant water damage on an interior light fixture, as well as the significant rot on the ceiling joist.